"The 65th Annual Banquet of the Richardson Light Guard Company A was held in the armory on Wednesday night, October 18th. Dinner started at 7:45 p.m. and was followed by remarks from the guest speaker, Adjutant General Gardner Pearson. Pearson spoke at length about the need for compulsory service, adding that all young men between the ages of 18 and 21 shold have some military training. The format for the evening was altered considerably from previous years, with the elimination of the speeches and toasts. 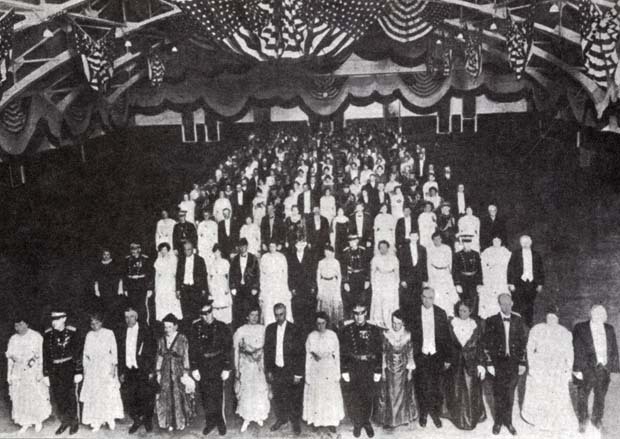 At the conclusion of the formal remarks, the hall was cleared and the grand march began, the military section led by Captain and Mrs. Connelly, and the fine members led by Mr. and Mrs. Charles Walton. It was followed by a flashlight photograph of the more than 300 people in attendance taken from the balcony. The Military Ball began at 9:30 p.m. For those who did not wish to dance, whist and other games were played in the smaller rooms in the armory." -- Text from calendar by Jayne M. D'Onofrio. “65th Annual Banquet, Company A, October 16, 1916,” NOBLE Digital Heritage, accessed April 20, 2019, https://digitalheritage.noblenet.org/noble/items/show/6834.